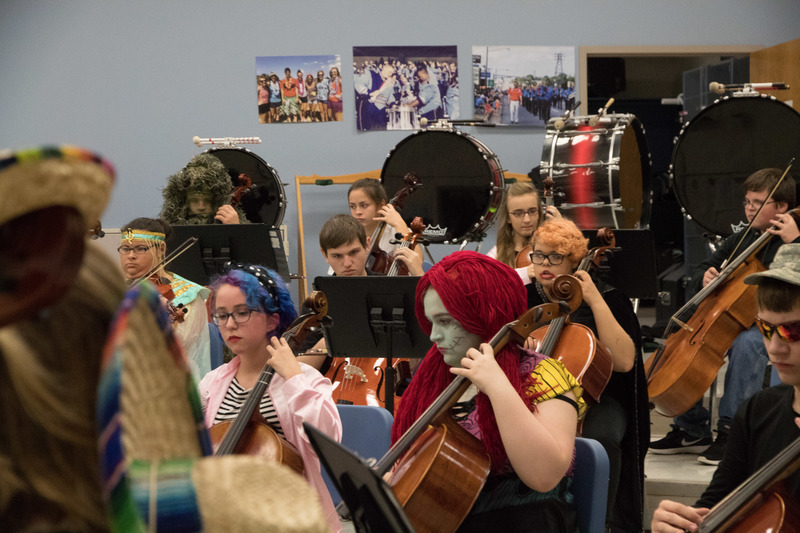 The Alliance High School and 8th grade orchestras performed another successful “Strings Spooktacular.” The concert was the tenth annual for AHS and featured the students wearing Halloween costumes and playing festive songs. The orchestras were directed by Ms. Crystal Sabik and Mr. Thomas Roblee. The concert began with the 8th grade orchestra performing “Skin and Bones” by Michael Story and “Gargoyles” by Doug Spata. Middle school principal Mr. Troy Russell, in costume, introduced the orchestra and gave descriptions of the songs. The high school orchestra then took the stage to perform. 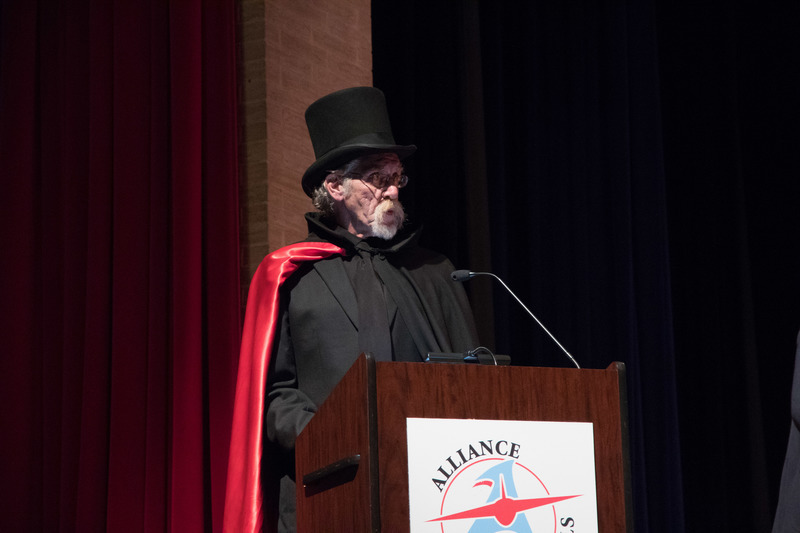 AHS Assistant Principal Dan Oberhauser was also in costume as he introduced the songs: “Waltz of the Wicked” by Kirt Mosier, “The Evil Eye and the Hideous Heart” by Alan Lee Silva and “Curse of the Rosin Eating Zombies from Outer Space” by Richard Meyer. “The Evil Eye and the Hideous Heart” was inspired by Edgar Allan Poe’s iconic short story “The Tell-Tale Heart.” Mr. James Ballor did a dramatic reading of the story while the orchestra played. Mr. Roblee added percussion. 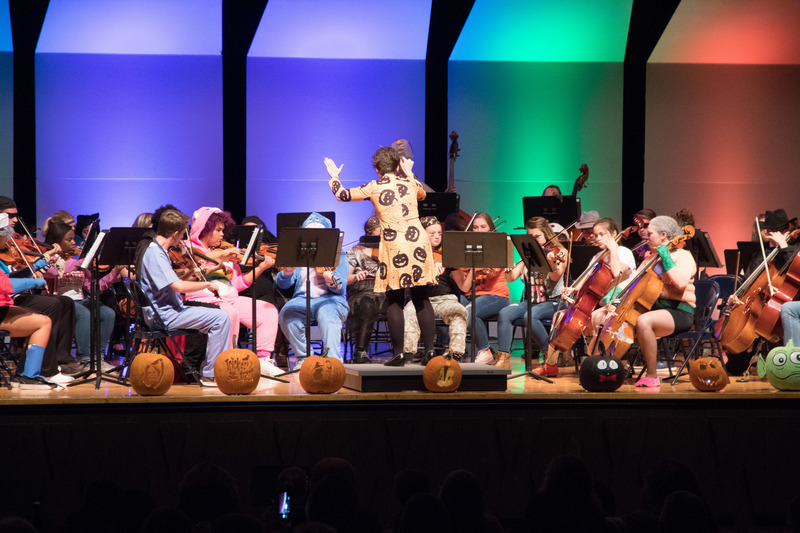 The concert concluded with the combined orchestras performing “Goblin Dance” by Doug Spata, while students from the 7th grade orchestra passed out candy to the audience. Freshman Nikki Cox was pleased with her first Spooktacular as a high school student. “I think as an ensemble we did pretty well,” she said. Cheyane Benning, a junior, chose “Curse of the Rosin Eating Zombies from Outer Space” as her favorite song at the concert. “My favorite part was when my friend Stefan got to scream during the song. It was very funny,” she said. 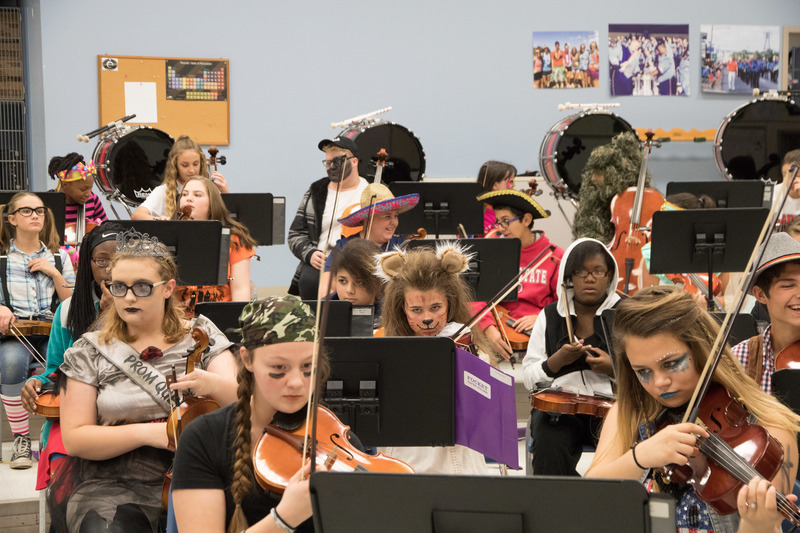 Ms. Sabik said the idea for the Halloween-themed concert 10 years ago was a good one. “It allows us to play some different music and it attracts more people to the concert,” she said. The AHS orchestra’s next concert will be Dec. 11 at 7:00 pm at Alliance High School and will also feature the AHS choirs. The 8th grade orchestra will perform again Dec. 12 at the AMS Winter Arts Night. Mr. James Ballor, former English teacher and accomplished actor, does a dramatic reading of Poe's "The Tell-Tale Heart"
Ms. Crystal Sabik directs the AHS orchestra in their Halloween-themed concert. Orchestra and Interactive Media students carved the pumpkins.